312km cycling event starting from Raynes Park. Controls at Lasham , Amesbury, Whitchurch and Ascot, plus 3 information controls. 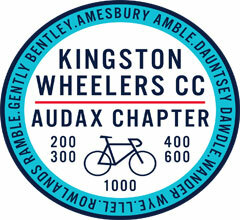 EVENT NOW FULL Ride out to Wiltshire and back in a day! Start and arriv�e at a scout hall where brekky, dinner and two nights accommodation will be available (bring your own mat and sleeping bag please).